In this tutorial you will find quick tutorial to install adobe flash player on linux or Ubuntu for all versions. There are many methods available to install flash online. For offline installation just follow below steps. Download adobe flash player from below link and get compressed tar file as shown in below picture. open the terminal then change directory to extracted folder. Now we have to identify browser plugin location. Generally mozilla firefox searches plugin in the following order (For linux). Directory pointed by MOZ_PLUGIN_PATH environment variable and following below directories. So you can place plugin in any of the above mentioned folders. Option 3 is recomended. Because flash player will be installed to all users. If you choose Option 2, then for that user only plugin will be installed. Once you decide where to place plugin, then just run below command to copy libflashplayer.so to plugin directory. That's it.Now restart the firefox. 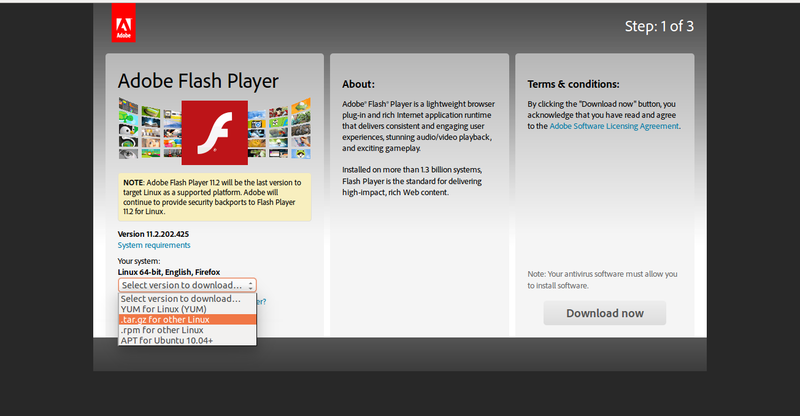 Check adobe flash player is installed or not? Just open about:plugins in firefox, You will find libflashplayer.so in that page as a installed plugin for MIME type application/x-shockwave-flash as shown below. Feel free to contact me through any medium. I love to help you any time.